American Rivers and the Hispanic Access Foundation are sparking a dialogue among tens of thousands of Latinos across the Colorado River basin, where one-third of the nation’s Latinos live and work, about the need for a healthy Colorado River. Starting on Earth Day, April 22, congregations from Denver to Los Angeles began screening a Spanish-language version of the award-winning film, “I Am Red” as part of their discussions about protecting God’s creation, the importance of the Colorado River and its tributaries, and the need for conservation. “The Colorado River connects us all, and when it comes to creating a better future for our communities we’re all in this together,” said Matt Rice, Colorado Basin Director for American Rivers. In addition, the Hispanic Access Foundation in partnership with Por La Creación: Faith-based Alliance will air the video at a conference of Latino faith leaders on May 23 in San Diego.Two hundred pastors are expected to participate, representing more than 3,000 youth from Western states. The video will also air at a June 13 event in Coachella, Calif. with 1,000 Latino youth expected to attend. 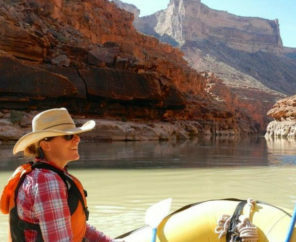 American Rivers has named the Colorado River one of America’s Most Endangered Rivers for the past three years. The river is threatened by outdated water management as well as harmful development projects and pollution in the Grand Canyon. The Colorado River is the lifeblood of the southwest. Its water sustains over 35 million people and endangered fish and wildlife in seven states. The river drives a $1.4 trillion economy, according to a 2014 Arizona State University study. Dozens of rivers are part of the Colorado River system, including the Green River, Gila River, San Juan River, and the Gunnison River. Over-allocation and drought have placed significant stress on water supplies and river health. For more information in English visit www.AmericanRivers.org/Colorado in Spanish visit www.SoyRojo.org.